Sorry for being absent from blogging. My 88-year-old mother got sick when I was visiting her in India. As a result my two-week trip turned out to be two months long. I am glad I was able to spend time with mom when she was not well. When I came back from India, my two protea bushes greeted me with overflowing blooms along with weeds as tall as me. I harvested some blooms from the front garden and arranged them for my home. I am hoping these fresh flowers motivate me to start working in the garden. For more memorable centerpieces, tablescapes, and recipes (including vegetarian, gluten free and vegan recipes),please check out my books, Entertaining From an Ethnic Indian Kitchen and Trader Joe's Simply Indian at my website komalinunna.com. Beautiful flowers. I'm featuring your post today at Foodie Friday and Everything Else. I am a chemist. After my children went to college, I decided to follow my passion - cooking and entertaining. 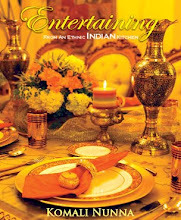 I wrote and published a book called Entertaining From an Ethnic Indian Kitchen. My book is a fusion of Eastern philosophy with Western style. It is a cookbook, entertaining book and coffee table book all in one. It is a 320-page hardbound book with over 260 luscious photographs. This book will make the most beautiful coffee table book to salivate your taste buds and stimulate your mind with Indian culture and traditions. 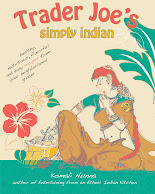 My goal is to demystify Indian food and promote the health benefits of spices. Please check out my website, http://www.komalinunna.com, for more information about my book. My other hobbies include gardening, flower arranging, cake decorating and tablescaping. I want to share all the beautiful things that inspire me. I hope that this blog is a source of accessible and attainable information for people who visit. I would love to hear from you. Please leave me a note by clicking on the comments section at the end of each blog. You can send me an email at komali@komalinunna.com. Thanks for visiting my blog.